The Newfoundland is one of the most commonly recognised dogs on the planet, if not by name, by appearance. Its cuddly, commanding build is a sight to behold and the breed has maintained a loyal following throughout the centuries, not purely for its attractiveness but for its protective instincts and skilfulness. As a breed, its history is hard to pin down and abounds with tales of heroism that stretch as far back as the 1600s. The breed acquired its name from its place of origin – Newfoundland, Canada, where it was a popular working dog on the remote landscape. Where it came from is a mystery, although many have their theories about the type of dog it descends from and the nature of its early usage. Some say it descends from the Great Pyrenees, which was brought to Canada by Basque fishermen. Others believe it descends from the now extinct St. John’s dog, which was indigenous to Newfoundland and bears a striking resemblance to early Newfoundlands. Additionally, some claim the breed descends from the English or Tibetan Mastiff, the St. Bernard, Great Dane or various lookalike Nordic breeds. With limited to no records supporting these theories, the Newfoundland is a difficult one to trace. What we do know is that the breed began life as a working dog over both land and water, helping with heavy draft work and assisting the fishermen with net retrieval and carrying a line to land. They also excelled at water rescue and became expert lifesavers in the North Atlantic because of their natural affinity with water. The Newfoundland’s thick, water-resistant coat and webbed feet perfectly facilitated this role and it wasn’t long before nearly every ship had a Newfoundland onboard. If the sea was too choppy to safely approach land or there’d been a shipwreck, a dog would swim ashore with a line. It is even theorised that Napoleon himself was rescued from drowning by his companion Newfoundland, Henri. This dog was so loyal and brutish that he was easily recognised at Napoleon’s side and there were concerns the enemy would soon detect Napoleon on the battlefield. Other noteworthy Newfoundlands include those owned by Sir Walter Scott, Samuel Adams, Charles Dickens, Lord Byron, George Washington and Benjamin Franklin. Today, the Newfoundland remains a popular breed choice, although its sheer size makes it unsuitable for some homes and lifestyles. 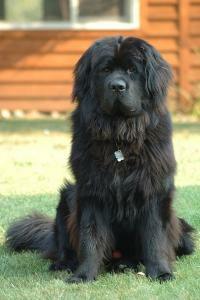 Nicknamed the ‘gentle giant,’ the Newfoundland is not only big but as a breed it drools heavily and sheds excessively. The breed’s intelligence also necessitates regular exercise and mental enrichment for a happy and healthy existence. If you are the proud owner of one of these gorgeous animals, please let us know! Don’t forget to visit our dedicated breed page for more info and to view some of our customer’s Newfoundlands.